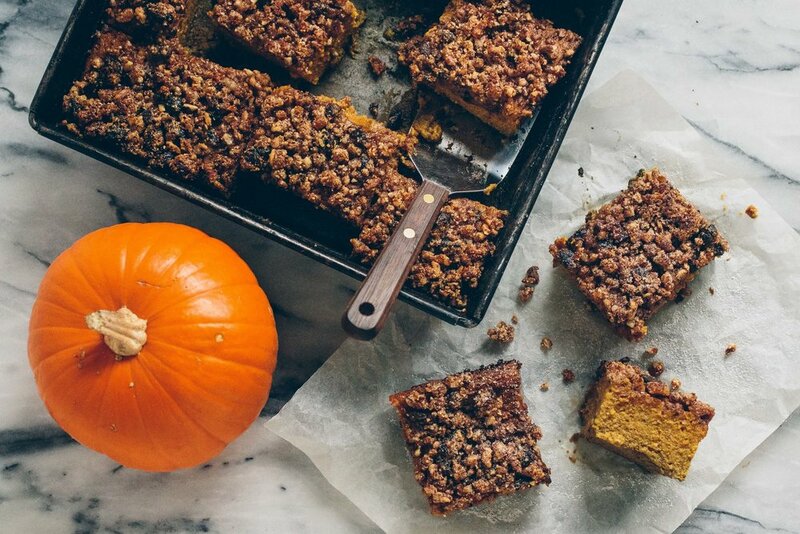 This definitely belongs in your pumpkin recipe arsenal. I started brainstorming this recipe as a sort of breakfast bake. I’ve been on a serious squash kick (red curry is a new favorite), sometimes including it in all 3 meals of the day. But somewhere in the baking of the custard, I had the thought that it needed texture. A little crunch. And since grain-free crumbles are arguably better than oat-based crumbles, it just kind of happened. So now maybe we should call it dessert, since despite all the veggies packed in, it seems a little too fun for a breakfast? Maybe a brunch? Or a brinner on a day that calls for it. Definitely use whatever squash you are loving on right now. Carrots or no carrots, it shouldn’t matter. Don’t skip the pears though. Or sub in apples? Since squash and apples are another favorite combo of mine, I’m sure it would work. On a large baking sheet, combine the peeled squash, carrots, and pears (I used 1 baby sugar pie pumpkin, 4 carrots, and 3 pears). Roast at 375F until tender (time will vary from 30-60 minutes depending on squash used). Once cooked, allow them to cool slightly before pureeing into a smooth mash. Measure out 3 cups total to add to the custard. While the squash, etc is cooling, combine the eggs, coconut cream, maple syrup, blackstrap molasses, orange juice & zest, vanilla, pumpkin pie spice, nutmeg, and sea salt. Whisk well to combine (or use an immersion blender for a very smooth mix). Add the mashed squash mix and 1/2 c. hazelnut meal and whisk well again. Pour the custard mix into a 9×13 baking dish. Bake for 40 minutes or until the edges have set but the center is still a bit jiggly. Have the crumble topping ready by pulsing all the ingredients together in a food processor until coarsely mixed. Scatter the crumble topping lightly across the top of the partially-cooked custard and put the pan back into the oven. Bake for another 10-20 minutes, or until a toothpick inserted into the center comes out clean. Allow the custard to cool in the pan for 10-15 minutes before serving. This recipe is so good that I’ve made it twice now. Once for friends, once for just me. 😉 All my non-Paleo friends thought it delicious. It’s great that almost all the sweetness in this comes from the roasted fruits and veggies and from a tiny bit of molasses which is super healthy anyway. This is a perfect Autumn treat that I enjoyed many times for breakfast, brunch, and dessert.